The new St. Pölten-Vienna leg becomes operational, and Vienna’s new main station also begins a number of operations. 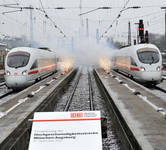 The expanded Augsburg-Munich line is inaugurated and commences operations. 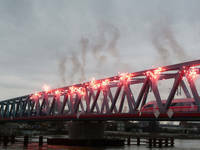 The Rhine bridge between Strasbourg and Kehl is inaugurated with a new double-track railway. The 300-km high-speed rail line Paris-Baudrecourt becomes operational, enabling regular cross-border TGV connections among Paris, Strasbourg, Karlsruhe, Stuttgart, Ulm, Augsburg, and Munich. The new four-track Danube bridge between Ulm and Neu-Ulm becomes operational, along with the lowered Ulm-Augsburg railway line at the Neu-Ulm train station. The new railway connection Ulm-Kempten is constructed. Prof. Dr. Péter Balázs is named E.U. coordinator of the Trans-European Transport Networks priority project Paris-Bratislava (PP17). The Main Line becomes a priority project of the Trans-European Transport Networks (TEN-T, PP17 and parts of PP22; decision no. 884/2004/EG of the European Parliament and Council). Germany’s Federal Minister of Transport and France’s Minister of Equipment, Housing, and Transport sign an agreement to construct a high-speed railway linking Paris, eastern France, and southwestern Germany (the “La Rochelle Agreement”).